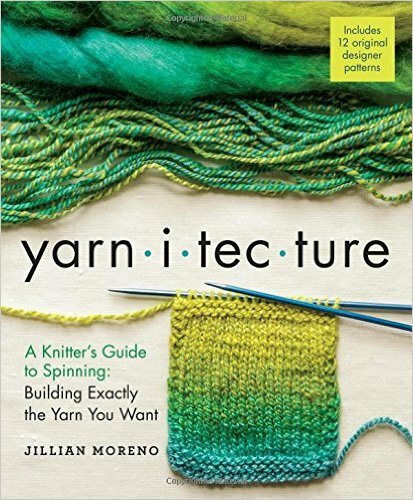 Jillian Moreno has just released a fabulous new book Yarnitecture. It's a spinner's bible, full of techniques and projects, all geared towards spinning the yarn you want for the project you want with a heavy emphasis on color color color. Jillian has an upbeat way of organizing information and describing that which can only be considered tactile, making it fun and easily accessible. The first half of the book is full of spinning techniques...the "how you get the yarn you want" section. Then comes the "project you want" section with 12 fun projects for handspun yarns complete with very cool "spinning notes" about the specific yarns with each. I am honored to have a project in this section, the Sweet Omega Moebius Wrap. Its a combinination of knitting and crochet for a unique look. The aran weight singles yarn is quick to spin, especially from Three Waters Farm 40% merino/40% superwash merino/20% tussah silk fiber which splits so beautifully and drafts like a dream. The pattern is very forgiving to handspun; size isn't crucial with a wrap. Project patterns aren't listed on ravelry yet but when they are I'll come back and add the link. One of the best tools a knitter can have in her arsenal is the ability to knit back and forth without turning. In otherwords, the ability to knit backwards or left handed. I figured out how to do this a long time ago because I was too impatient to turn for bobbles, short rows and entrelac. Some of my knitter friends also figured out how to knit backwards as well and their methods are different from mine; you all know I'm from the school of "whatever works", so here's a little video that shows you how I do it. Try it and see if it works for you. If it doesn't, play around and see what you can do with your own style of knitting to make it work. It will rock your world. This video shows a three stitch mini-bobble, but you can apply the technique to any number of stitches worked in garter stitch. 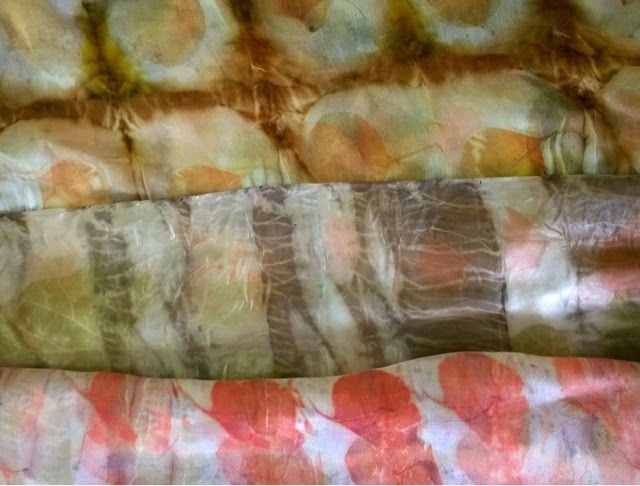 Jan Quarles of Daily Fibers and I just got together for a long awaited girl's weekend of natural dyeing. 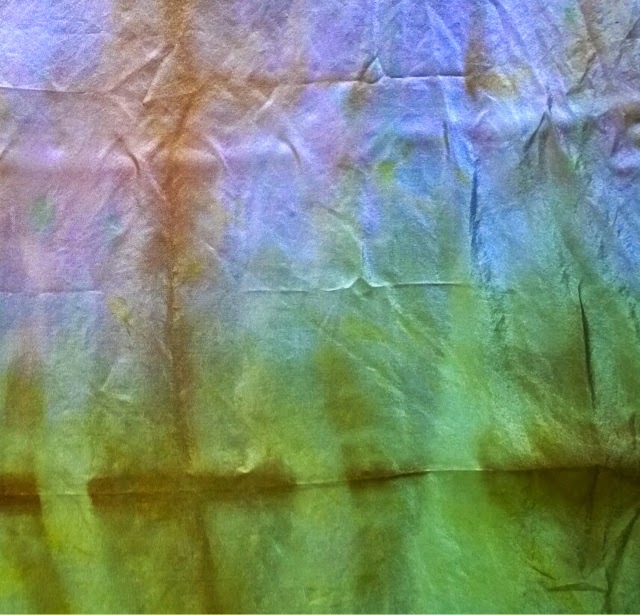 We played with Jan's style of combining eco printing and shibori techniques. She had been stockpiling eucalyptus and rose leaves and I had scored tons of red cabbage leaves from Carlene Mayes the flower lady a the Sewanee Farmers Market. I had also foraged for walnut hulls and red plum leaves and had saved a winters worth of red onion skins. The pieces above are Jan's; from top to bottom a combination of red onion skins and eucalyptus leaves, walnuts with eucs and just plain eucs. 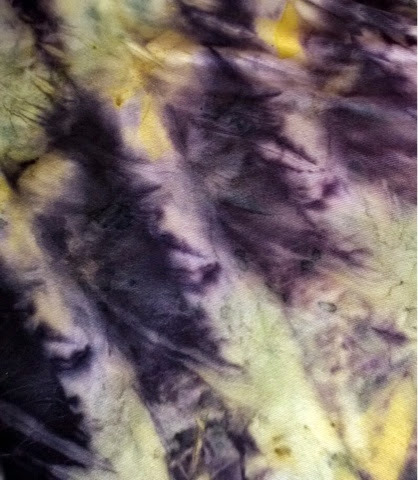 We really had fun with the red cabbage bath. 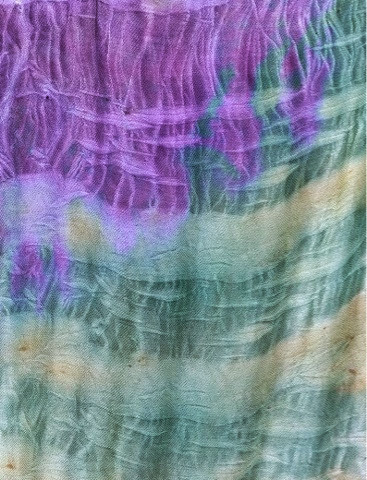 Silk, wool and cotton all came out a lovely rose lavender, but with a quick dip in an alkaline afterbath we got not blue but brilliant green!!! 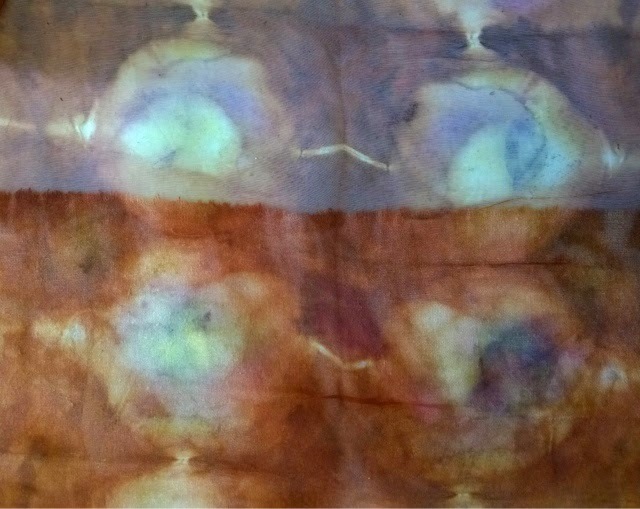 My plum leaves with red onion skins on organza. And of course, Jan wouldn't be Jan without logwood. I've been a mad pinner on Pinterest for a while now. Curating is spellbinding, but the finished product, ie. the boards, illuminate my own aesthetic like nothing else I've ever been involved with. I bet this is true for all of you as well. Do you go back and look at what you've pinned? Do your groupings shed life on where and who you are right now? I bet they do. So now I'm getting interested in Tumblr for the same reason. Inspired by my groupings on Pinterest I find it easier to compose photos, paintings, drawings of my own with a new found self awareness. Add to the fact that I finally got to upgrade my phone, the irises are blooming, spring is happening, I'm immersed in collecting my own work just as I was collecting others' on Pinterest. If you'd like to see more Lynne Vogel originals, please follow me on Tumblr . And please enjoy these photos of our local iris. Most of these photos were taken in our own yard with the exception of the lavender speckled ones which live in front of the dean's house down the street. Dubose will happen again this year! Hoorah! This retreat has taken on a life of its own now and I don't even need to be there for it to be self perpetuating. And that's a good thing, cuz I won't be able to be there this year. But have no fear. The same fun you have come to expect will be there for you anyway, thanks to the dedication of two long time Dubose goers, Jan Quarles and Christina Consiglio. As many of you know, Jan has been my right hand woman at Dubose and Harrisville for some time. She and Christina have organized a beautiful retreat this year, calling it Weekend of Fiber at Dubose. You can read all about it here and you'll also find them on their new Rav group "Weekend of Fiber". So please come and enjoy a weekend of relaxation, great company, and all things fiber. 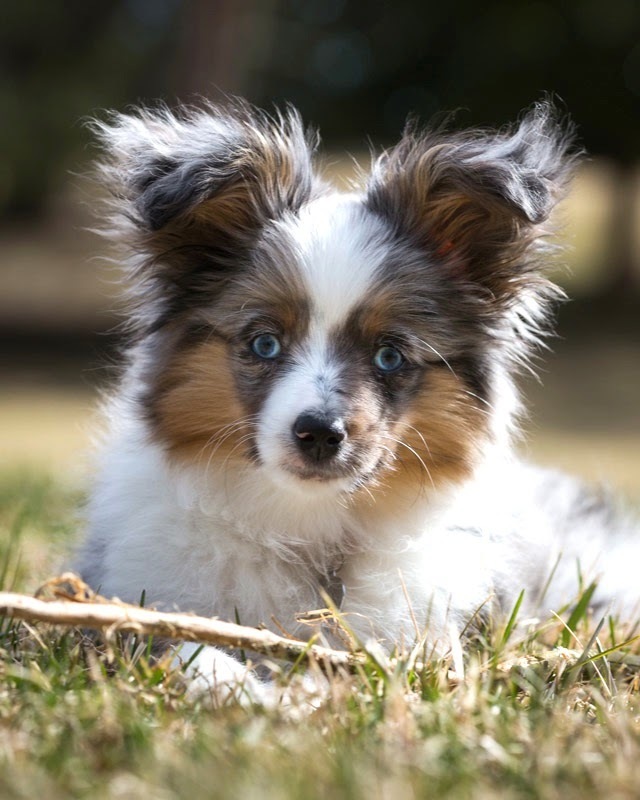 Meet Ebee, our newest member of the family. That's pronounced like "email"...with the accent on the "E". Currently at 17 weeks; our talking scale tells her, "You weight 6 pounds. Have a nice day." One reason I haven't been posting her like crazy is that she is really hard to photograph. 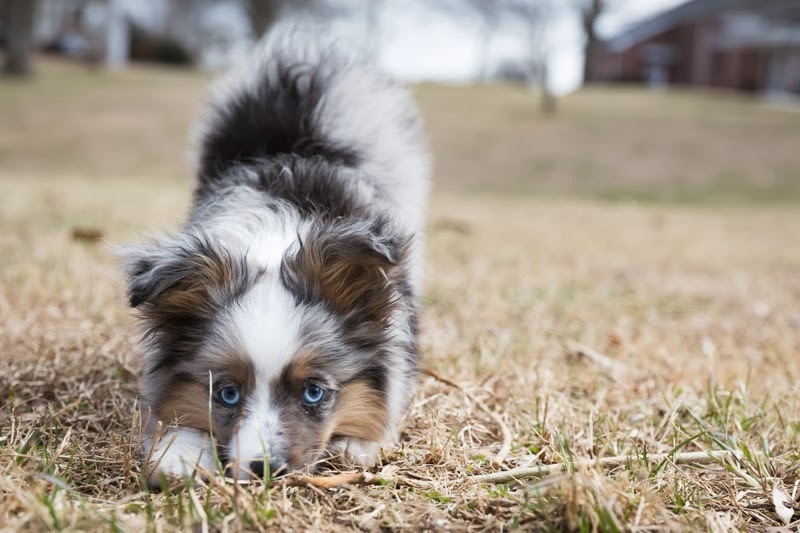 Unlike the photogenic Monk, she just catches light funny and ends up looking more like a cartoon character than the beautiful little mini aussie that she is. Wish I could take credit for these beauties but they are the work of Leighton Smith who got right down on the ground with his professional camera to capture her essence. So I decided to compare my addi lace and sock rockets points to see if there is a difference and yes, there is. Here they are as proof. The tip of the sock rocket (top, US 2/2.75mm) is a little shorter than the lace (US 2/3.00mm). I held them against my 2.75mm lace points as well...same difference. Shorter point equals duller point...just a fact of life. You can also really see how much bigger the 3.00mm is, so don't go by the US number when purchasing addi needles. Besides the fact that the rocket point isn't as sharp, it is also a little slipperier, which does affect my tension ever so slightly. The brass finish on the lace needles is just a tad slower (more so when they are tarnished) and sometimes this really works to my advantage. Brass has an odor that nickel does not and it is more noticeable when the finish is tarnished. I polish mine with a tiny drop of Wenol and they stay shiny for a long time. Isn't it amazing how many differences there are between the two? So many details go into personal preference. Lately I've been talking to all my knitter friends about their preferences for knitting in the round. It seems that they either love or hate magic loop, so I'm going to offer my tips for successful magic loop knitting. It's all in the curve of the needles. When you change sides, you need to pull your right needle towards you, then let it curve back around to face the left hand needle. This puts more curve into the back needle, which enables you to pull the stitches at the seque snug enough to avoid ladders. This is how the loops should look. I love magic loop because I can knit with a puppy in my lap and not disturb her with extra points or dangling needles. The needles stay put when I'm not knitting and I can work more stitches before changing needles, which is especially great when working an intricate stitch pattern. It also doesn't matter if there are more stitches on one needle than the other either...so you can increase for a thumb and not have to transfer stitches.